Gauracandra Das: That’s Shymsundar in front and Guru Das (names misspelled in the photo blurb) behind him. They won awards for the very first Apple Records release: ‘Radha Krishna Temple Album London’. 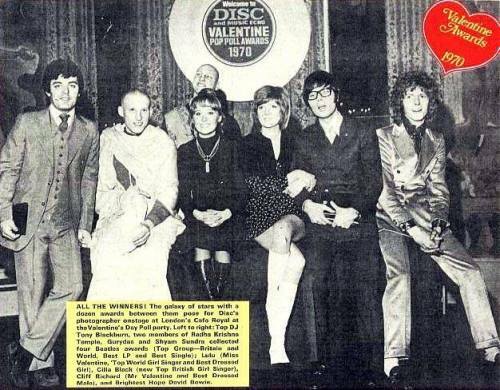 Their awards were Top Group- Britain and World, Best LP and Best single. David Bowie is on the right with curly hair. He won for the most promising newcomer at this awards show. Cliff Richard is to the left of him; Cliff bought a property near me in Portugal in the 1960s and we eventually met in Estoril. Cilla Black is farther left, and Lulu is left of her. Top UK DJ Tony Blackburn is all the way on the left. ← A devotee of Lord Krishna runs for the US presidency. (CNN) Rep….